Each year, Wise County coordinates a massive cleanup of the Guest River Gorge. Tim McAfee is the point of contact with respect to having paddlers participate with the clean up. It is a great way to provide community service, and it directly impacts the environmental quality of the gorge. This year, the event is on April 21st. We meet at the put in for the Gorge at 9:00 A.M., and usually spend 2-4 hours in gathering trash along the river banks, and eddies. Lunch is provided, and we have a free shuttle back to the parking lot. Most of the time we get to Toilet Bowl rapid and get shuttled back up. Obviously, water levels could impact whether we can participate. But even at low flows, we can scrape down as far as Toilet Bowl. 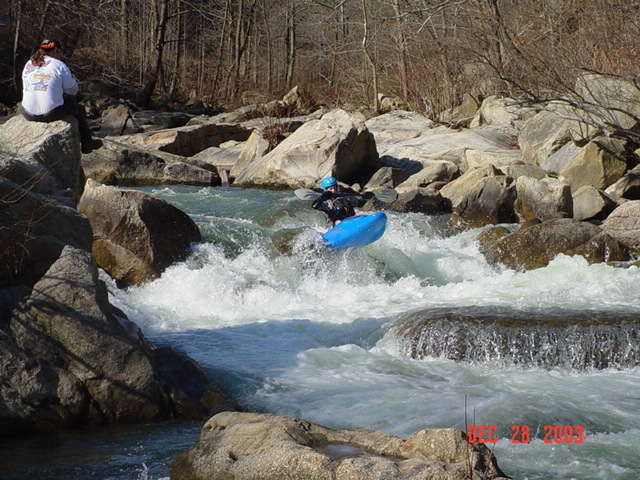 One of the reasons that kayakers are needed is to assist in gathering trash along the right river bank, which is not accessible except by crossing the river. Please make every effort to attend. Please invite anyone that might be willing to help. Tim would like to know who is attending so he can advise the authorities. Congrats to Dane, Geoff, and Isaac for the podium finishes! We had a record Turnout for the race this year. Ninety six racers by my count. This was the 21st edition of the Russell Fork Race. It was renamed “The Lord of the Fork” race in honor of Jon Lord, who died at Tower in 2004. If you could decipher the script at the bottom of the bibs, it pays tribute to him. I would like to mention that Chris Hipgrave, who for years held the course record for the race, which he set in a Wavehopper, was part of the very first timed event in 1995. He has been a regular, and is still at the top of the field, competing against some who weren’t even born then. Well done Chris! The 30 second interval start seemed to go over well. I know there were a number of passes, which we hope to minimize. It was sure exciting to watch at the finish. Thanks for your patience with the delayed start. We had a number of very late entries, which we’ll need to find a better way to deal with next year. Safety is always a worry when organizing an event such as this. Thanks to those who were willing to set safety along the river. JB Seay and BJ Phillips hiked in with safety gear. Others paddled in. Thanks to all who volunteered: Jesse Sammons, Gerald Delong and Daman Patterson for starting everyone off. Sadly Willy Witt had to miss out on his duties there this year. Jay Ditty, who was willing to start early after sprinting to the start after dealing with the late entries, and then race first to help with timing. And Maggie Snowel for registration, and bib management. My least favorite part of an event like this is hounding folks for their bibs. Thanks to all who made our life easier by handing them back. And Thanks to all who donated to cover costs. Many gave extra, which will cover most of our annual expense, which is primarily insurance. And to those who donated prizes and awards. Volunteers needed for March 28 Powell River cleanup in Appalachia, VA. Volunteers are needed for a regional stream cleanup on Saturday, March 28, beginning at 10 a.m. at the Powell River Trailhead in the town of Appalachia. This event aims to remove as much litter as possible not only to help beautify the area, but also to help promote a Rails to Trails project being coordinated by the town. Upper Tennessee River Roundtable is asking local paddling groups to assist with the cleanup so that litter can be removed from the water. Other volunteers will pick up litter along the river banks. The cleanup will encompass about three miles of the river. This regional cleanup event is a part of a nation-wide event called the Great American Cleanup sponsored by Keep America Beautiful (KAB) and locally organized by Keep Southwest Virginia Beautiful, the largest regional KAB affiliate. The cleanup also is part of the Regional Stream Cleanup sponsored by Tennessee Valley Authority and organized by Upper Tennessee River Roundtable. GLAD® trash bags and Niagara® water will be provided by the Great American Cleanup. TVA is providing bags, gloves and litter grabbers. Keep Wise County Beautiful will provide lunch. To volunteer, contact Upper Tennessee River Roundtable at (276) 628-1600 or utrr_vista@yahoo.com. First Yaak Run this year..
A group of boaters from Spokane, Couer d’Alene and Bonners Ferry made an early season run on the Yaak River of Montana just last week and got a good show. It was just days after a spike in the gauge indicated that the ice dams had let go and levels were starting to drop as local temps fell back to normal. The Yaak River canyon is a favorite exciting and scenic day trip for local paddlers. This year we were able to get lucky with our timing and see some impressive eight foot to twenty foot high ice/snow walls along the river’s edge. At this point the only new wood to report was one piece in the last rapid named “Good to the Last Drop”. It is on river left just below the entrance to the rapid and can be seen with a quick scout. The log can be completely avoided if on line, but could become an issue if pushed off line to the left at the entrance. A group may try to clean the wood out over the next week. Stay safe and see you on the water.